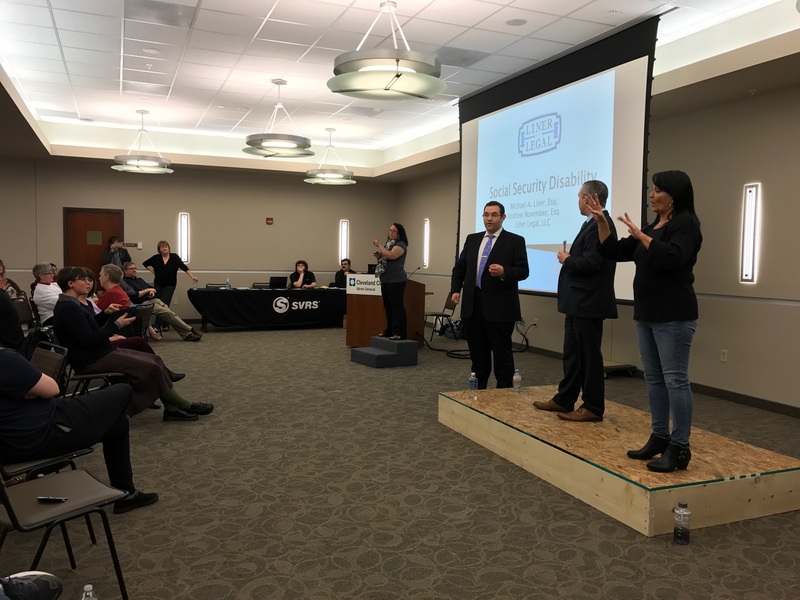 Liner Legal attorneys Andrew November and Michael Liner were asked to present on the topic of Social Security disability at the Deaf Community Workshop in Green, Ohio on April 22, 2017. Hosted by the Deaf Outreach Church of North Canton as well as Greater Akron Deaf Services, the event attracted more than 150 Deaf, hard of hearing, low vision as well as hearing individuals. The event was presented in American Sign Language with a team of interpreters ranging from veteran interpreters to interpreting students from Kent State University. The all-day workshop covered a wide range of topics including the LEAD-K campaign, VRS and Social Security Disability. Michael and Andrew’s presentation was uniquely tailored to those in the Deaf community. Indeed, Andrew presented on the medical criteria used by the Social Security Administration to evaluate a claim based on deafness. When presented with a claim for Social Security disability benefits, Social Security benefits are often awarded based on an evaluation of the Medical Listings. The Medical Listings have a section dedicated to hearing loss. The evaluation process is different for those with a cochlear implant and those without. Andrew recalled a recent courtroom experience where he disqualified an inaccurate audio-gram because it failed to comply with the stringent testing requirements used by Social Security in evaluating one’s hearing loss. With that, Andrew encouraged the attendees to advocate for themselves while at the audiologist and to make sure the specific tests are performed. Following the comprehensive discussion, Michael and Andrew took questions from the attendees. Not only did this allow the audience to ask clarifying questions, but it gave them the opportunity to have the attorneys attention to ask any question that they had been carrying around.